Jam is a social networking tool used by your employees to share a variety of content online with their coworkers. Users can post links to relevant articles from external sites, record a video, start a discussion, or share an internal document from the company’s SharePoint instance. Jam supplies a video creation tool within the application that allows users to create a video without leaving Jam or their browser. Users have an initial option of recording themselves with a webcam or recording their screen. Additionally, video content is considerably compressed for exceptional data sizing and storage. And with mobile capabilities, an employee can record video of a presentation from SuccessConnect and share it with their team, all from their phone. SuccessFactors Sam says, “I also really like Jam’s bookmark tool.” The bookmark tool with Jam allows users to post links on their profile from any site. “To start, I drag a button to my browser’s bookmarks bar. Then, as I’m clicking through external sites, like DallasMorningNews.com or NYTimes.com, I can find an interesting page and click the Jam bookmark to post it to my profile. It’s just like Pinterest!” said SuccessFactors Sam. An additional feature of Jam is employees groups, which can hold a small number of employees or the entire organization. Groups are used by employees, managers, and even administrators to share content with a specific group of employees. Administrators have the ability to create Auto Groups, which are mandatory employee groups. The administrator can choose the members of the Auto Group (e.g. all employees, new hires, management) and the members do not have authority to leave. Auto-Groups can allow only certain or all members to post to the group and are usually used for issuing training materials to new hires or relaying company news to employees. 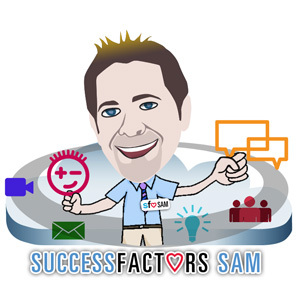 This entry was posted in SuccessFactors Sam and tagged Jam, SFSF, Success Factors, SuccessFactors. Bookmark the permalink.